We started Nature Tech Nursery in 2010, in part to help revive the BC hazelnut industry by importing new varieties that combine disease resistance with substantial yield increases. We also produce other foodscape plants and native perennials. Haley Argen has been involved in commercial nursery and greenhouse management for 18 years, but has been intimately involved in growing food for her family all of her life. Her belief in the imperative need to support sustainable interaction between people and the planet they inhabit, coupled with a love of plants, led her to embrace a career that uses plants in ways that helps to sustain all earth’s creatures. As owner of Nature Tech Nursery as well as in her role selling native landscape plants at NATS Nursery Ltd., her goal is to respect and support healthy and permanent ecological systems. She holds a Horticulture diploma with honours from the University of Guelph. Thom O’Dell has over thirty years experience as a biologist specializing in plants, fungi and their interactions. He has long been passionate about nut trees and first planted chestnuts in 1985. He received his Ph.D. in Botany and Plant Pathology from Oregon State University and held positions with the US Forest Service and National Park Service before immigrating to Canada. 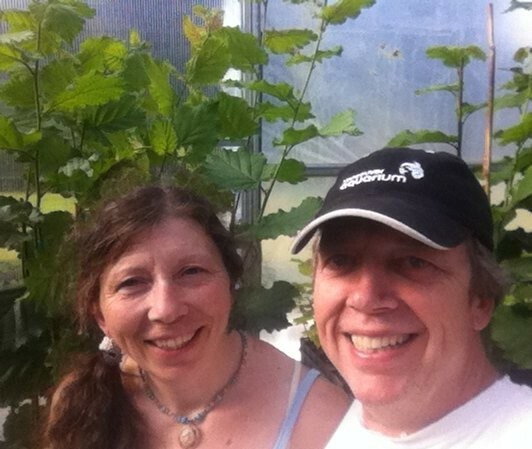 Thom manages greenhouse and nursery production and develops micropropagation methods for native and cultivated plants. He is consulting biologist supporting the BC Hazelnut Growers Association hazelnut variety trial with research design, data collection and analysis.